When i think of soup, I'm thinking comfort food, warm, hearty and fulfilling. This recipe was one of 3 recipes aired on Giada's Everyday Italian episode that had the Linguine with Shrimp in Lemon oil. 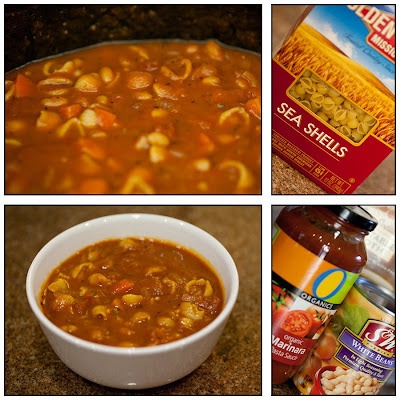 This soup is super easy and is made with marinara sauce. It says to use chicken broth in this recipe. I however have many friends who are vegetarian so i used vegetable broth instead. The flavors were great and the soup with absolutely delicious. It's a perfect dish to have on a cold day with some french bread on the side. I made it for my play date Thursday last week and it was great.Everyone enjoyed it and i saved some for my husband to have for dinner. What more can you ask for after a long work day:) Here's the recipe!